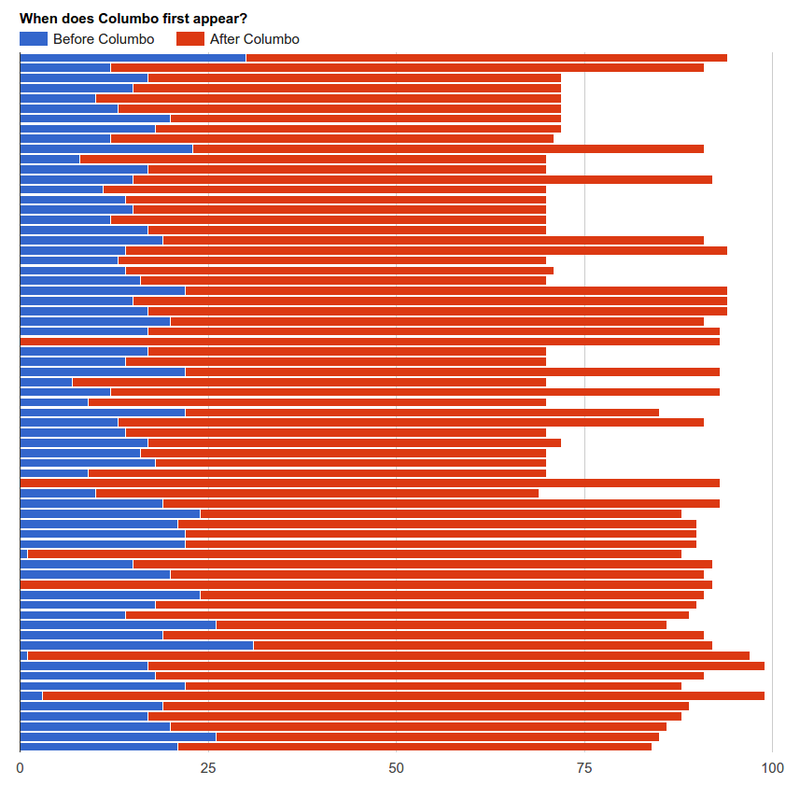 A graph showing when Columbo first appears in each episode. You can click through to a larger version in which you can see which episode is which. 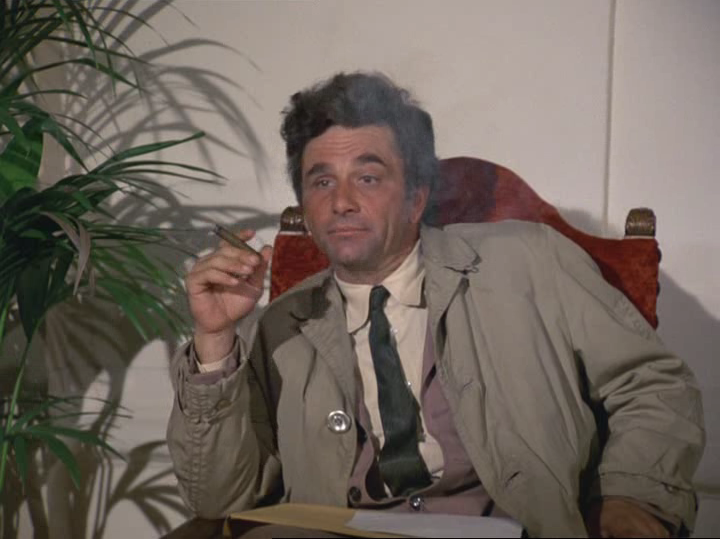 Anyway, I thought it might be nice to put the graph online, which is most of the point of this post, but thought I might add a few notes about why I like Columbo so much. Update (2017-10-22): I’ve fixed an error in Columbo’s first appearance time for “Candidate for Crime”, kindly spotted and pointed out by @columbophile! I think Columbo suffers rather from so many people remembering its clichés (e.g. 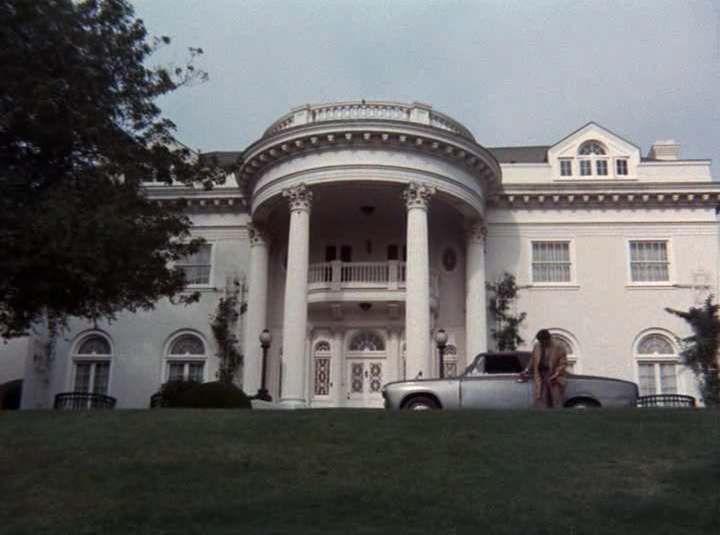 his basset hound (“Dog”), the cigars, the raincoat, “just one more thing”; his never-seen wife) but not necessarily the things that made it a powerful show. For me perhaps the most important of those is the way that class, power and wealth are treated on the show. There’s a joke on a Columbo podcast I sometimes listen to that he must work in a special department of the police force where he only deals with crimes of the very wealthy and privileged. 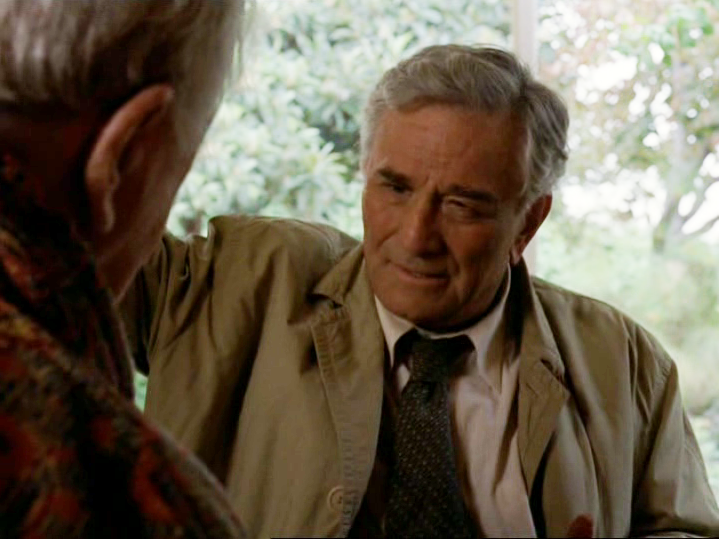 And indeed, the privilege of the murderers is frequently emphasized by Columbo; in one scene he literally tots up the value of someone’s house and possessions and works out with them how many years he’d have to work to afford them – and yet this is without bitterness, and he never drops the persona of the enthusiastic and respectful fan. I think this partly resonates with me so much because, while I’m undoubtedly incredibly fortunate in my situation in life, my job is to work on projects that try to increase the transparency of institutions that affect our lives and try to hold people in power to account. This is difficult, frustrating work, and it often seems (particularly in the political climate at the moment) that the successes are overwhelmed by the setbacks. 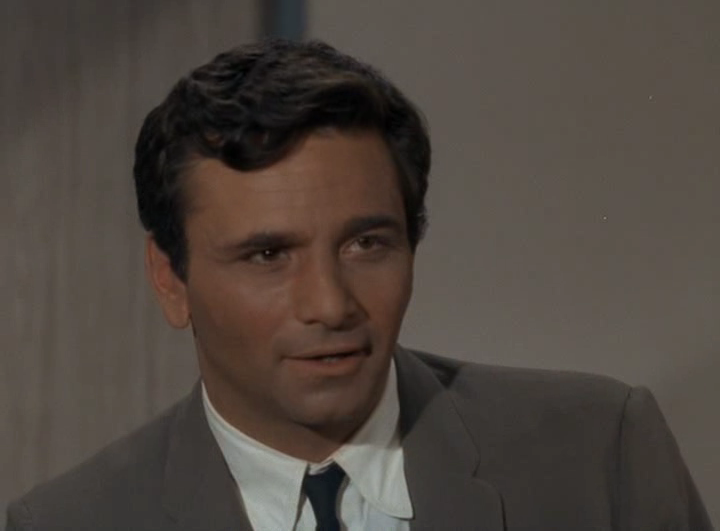 I could write a lot more about what makes the show important to me, why I admire the character of Columbo, and the various flaws I perceive in the show, but I’m trying to get some blog posts actually finished at the moment, so I’ll just leave you with some photos of Peter Falk throughout the 35 years that he played Columbo , and a list of the occupations of the murderers in the series. ¹ If I remember right, Zack Handlen made this point well on the Just One More Thing podcast. personally would want to…HaHa). You certainly put a fresh spin on a subject which has been written about for years.